Seven and a Half is a simple counting game that is said to be a predecessor of Blackjack. It’s easy to see the resemblance. In Blackjack, the goal is to reach a score of 21 without going over—in Seven and a Half, the object is the same, except instead of 21, the target score is, you guessed it, 7½! It can be played by up to around eight players. Seven and a Half most likely originated in Italy, and was spread throughout the world by Italian immigrants. It is still popular there, especially around Christmas, when it is traditionally played. Seven and a Half is also played in Spain and Brazil. The object of Seven and a Half is to, through selectively drawing more cards, obtain a better score than the dealer without going over 7½. 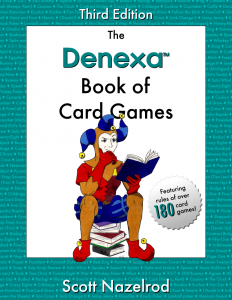 Seven and a Half is played with the 40-card deck commonly found in Italy. (This deck is also used to play Scopa and Briscola.) 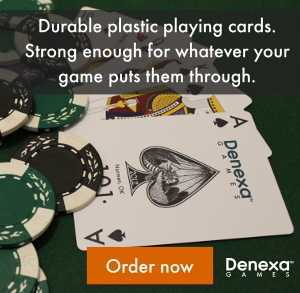 To form such a deck from a standard 52-card deck of cards like Denexa 100% Plastic Playing Cards, just remove all the 10s, 9s, and 8s. You’ll be left with a deck that has ten cards in each suit (ace through 7, and the three face cards). You will also need something to bet with. Because of the all of the winning and losing that will be taking place, using chips is highly recommended. If Blackjack dealing equipment is available, such as a shoe and a discard rack, it might be useful, but is not required. Each player who wishes to participate in the hand places their bet in front of them. Shuffle and deal one card, face down, to each active player, including the dealer. The player to the dealer’s left has the first turn to play. If they wish, they may state that they wish to hit or draw. If so, the banker deals them another card, face up. The player may continue to hit as long as they wish. When they are satisfied with the value of their hand, they stand or stay. The turn then passes to the next player to the left. If a player draws to a total of eight or more, they have busted. They reveal their hole card, and the banker immediately collects their bet. The banker also removes their cards to the discard pile. This player sits out for the rest of the hand. If the banker busts, they must pay each active player an amount equal to each of their individual bets. If they stand before busting, they collect the bets of each player with a total lower than the banker’s, and must pay each active player that ended with a total higher than the banker’s. Ties push, with the banker neither collecting nor paying any bets. If a player draws to a total of exactly 7½ in two cards—that is after hitting once they hold either a 7 and a face card, or the K♦ and another face card—they immediately turn their hole card face up. This is considered an automatic stand. When a player holds a two-card 7½, they take over as banker and dealer beginning with the next hand, unless the current banker also had a two-card 7½. If multiple players have such a 7½, the first one to the banker’s left is entitled to become the next banker. Seven and a Half is generally a much less formal game than Blackjack. Nonetheless, a review of Blackjack dealing procedures may be helpful to assist a prospective dealer in keeping the game orderly.